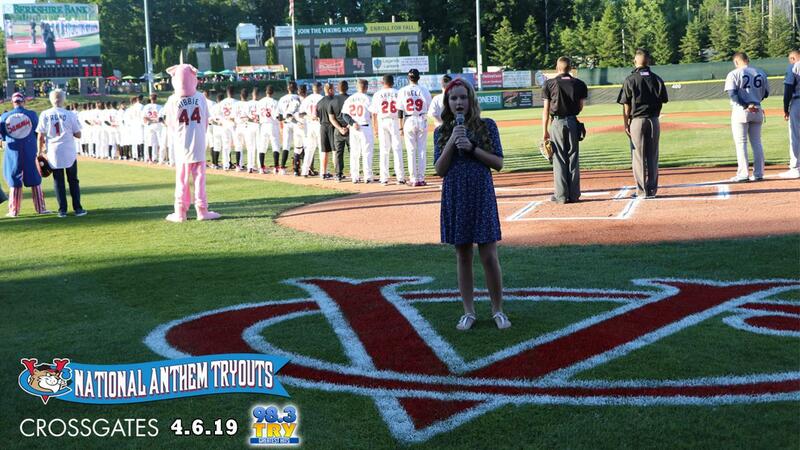 Finalists will have the opportunity to perform the National Anthem at Joseph L. Bruno Stadium this summer. TROY, NY - The Tri-City ValleyCats will be holding their 9th Annual National Anthem auditions on Saturday, April 6 at Crossgates from 10:00 a.m. to 12:30 p.m. Finalists will then participate in an online fan vote, with the top vote recipient having the opportunity to sing at a premier ValleyCats game at Joseph L. Bruno Stadium this summer, attended by an average crowd of over 5,000 fans. A panel of judges will be scoring the performances based on sound quality, stage presence and song accuracy. Jaime Roberts from Jaime in the Morning on 98-3 TRY will be a guest MC for the event, along with Sammy Baseball. The ValleyCats 2019 home opener is set for Sunday, June 16 as the 18th season of Minor League Baseball begins at Joseph L. Bruno Stadium in Troy. A Class A affiliate of the Houston Astros, the ValleyCats are coming off the heels of their third championship season since 2010. Season tickets, mini plans and flex vouchers for the ValleyCats' 2019 season are currently available for purchase online at tcvalleycats.com or by calling 518-629-CATS. The ValleyCats are also taking reservations for groups of 20 or more, and individual tickets go on sale March 28.